There is never a time, when the amount of work that goes into the cookie of the month is not appreciated. For me, just finding the inspiration to write a simple blog post can be crippling, let alone finding the time, then the motivation to actually sit down and write one. So, when Cookie O' The Month time rolls around, as I anxiously await the creative bakings, stylings, writings and all things "ings" from Baker Beth. I am highly aware of the effort that goes into such an endeavor. There's the inspiration, the prototyping, the finessing the subject matter during the photo shoot, and so much more. The fact, that this month there's the added bonus of Baxter as inspiration, well--it brings a tear to my eye and warmth to my heart. OK, the warmth could be from the fact that the humidity level in NYC is staggering, and the tear can also be contributed to how much I am going to miss my favorite Chinese food delivery place. I'm going on the road gain, starting tomorrow--BUT, that does not mean that this month's cookie is not truly spectacular. It is. Once again, my hat is off to you. Baxter is delighted. It was coincidence, I assure you. Except that I don't believe in coincidence, so let's call it fate. Last year, 'round this time, I invented a cookie based on Angelo's love of pasta with browned butter and Parmesan cheese. Yep, I put Parmesan cheese in a cookie. It created a bit of a stir. This year, I started mulling July's cookie and quickly came to the realization that Pecorino Romano cheese would have to be involved. Because this cookie is inspired by the revelation that Baxter likes his favorite dog food topped with a teaspoon of freshly grated Pecorino Romano cheese. How I have managed to create so many cookies for this site and not consider Baxter is a bit beyond me. Forgive me, Baxter. You are certainly worthy of such consideration. My friend Doreen was musing about a cookie inspired by the "dog days of summer." And she may have been thinking more literally and pondering a dog treat. But as Angelo has said, Baxter is a human in a dog suit, so I knew that a "real" cookie was the right way to go. Still, I wanted to take Baxter's tastes into account, even if he might not be eating these. So anything chocolate was out. Cheese, though, had to be part of the mix and Pecorino Romano is sharp and rather salty and "salty" made me think of salted caramels – Mmm! – which made me think of a sandwich cookie with a caramel filling but since I just made a sandwich cookie last month and I'd hate to be tiresome, I decided on a filled cookie instead because of all the cookies I've done here, I've never done a thumbprint. All of which is a very long way of getting around to introducing you to Baxter-inspired Caramel-Filled Pecorino-Romano Pecan Sandies. Position a rack in the center of the oven and heat the oven to 350°F. Spread pecans in a single layer on a cookie sheet. Toast for 10 minutes or until fragrant. Let cool completely and then grind them into small pieces. I use a nut grinder. You can use a food processor or, if you're handy with a chef's knife, finely chop them by hand. Put the nuts into a shallow bowl and set aside. Line two cookie sheets with parchment or nonstick baking liners. In a stand mixer fitted with a paddle attachment, beat the butter, confectioners’ sugar, vanilla, and cheese on medium speed until well blended, about 3 minutes. Scrape down the bowl and beater. Add the flour and mix on low speed until a soft dough forms, about 1 minute. Using a spoon or a cookie scoop, scoop about two teaspoons of dough for each cookie and roll into 1 1/4-inch balls. Roll 12 per sheet. For pecan-coated cookies, drop a ball of dough into the beaten egg and gently swirl to coat it and gingerly turn it with a fork. Pick it up with the fork, allowing the excess egg to drip off then transfer it to the bowl of finely chopped pecans. Again, swirl to coat. Remove to a cookie sheet and repeat with the remaining balls of dough. Bake one sheet at a time until the cookies begin to show tinges of golden brown, 15 to 20 minutes. Let the cookies cool on the sheet for 5 minutes and then transfer them to a rack to cool completely. Make the caramel filling**: In a small saucepan, combine the unwrapped caramels and heavy cream. Set the pan over low heat and stir constantly until the caramels have melted and the mixture is smooth. Set the cookie rack of cooled cookies over waxed paper next to the stove. Turn the heat under the caramel to the lowest possible setting to keep the caramel warm while you work. Using a small spoon, drop a bit of melted caramel into the indentation of each cookie. 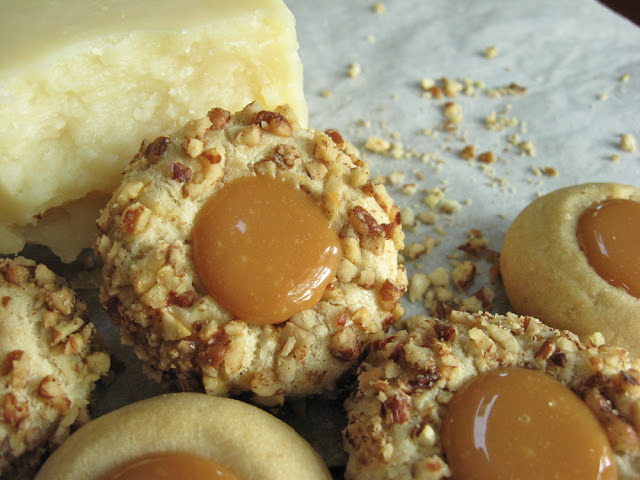 Allow caramel filling to completely before serving or storing the cookies. Store on a rimmed baking sheet in a single layer. Cover with plastic wrap, taking care to prevent the plastic from touching the caramel. * Microplaned cheese is pleasantly light and fluffy and mixes into the dough well. If you don't have a Microplane, treat yourself. It's a delightful kitchen gadget. ** Yes, you could make your own caramel for the filling but why reinvent the wheel? And for reference's sake, The Humane Society provides a list of foods that are potentially poisonous to pets. The ASPCA provides a lengthier list of foods about which you may have questions. Oh! I love the Baxter links you chose!